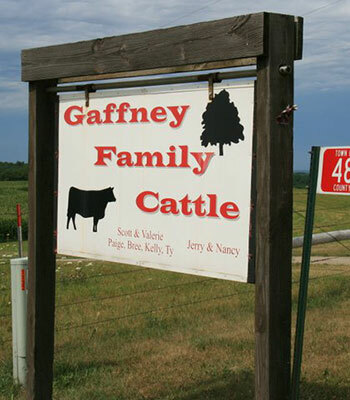 Gaffney Family Cattle was founded in 1976 as the result of Jerry and Nancy moving to Wisconsin from the Adams Brothers & Company Hereford Ranch in Kilgore, NE. In this move they brought with them 40 Horned Hereford cows and their three children Sara, Scott and Erin. The farm was set up for dairy cattle and a variety of small livestock. The farm has been since been changed to meet the needs of a growing 180 cow beef herd. In the '80s Jerry and Scott also started a small herd of commercial cows as a way to diversify the operation. The commercial cow herd met the growing needs for recipient cows as more embryo transfer was used. Angus began to roam the hills of the southwest Wisconsin farm in 1995. That year ALC Extra Special 504E was purchased as a herd sire. "Extra Special" was a descendant of the great Primrose Lady family. He was a cornerstone of the cow herd and the foundation of Gaffney Angus Farm. Pedigree, performance and structure are always emphasized in breeding decisions. Pounds Across the Scale. EPDs. Ultrasound. Genomics. Our family has submitted data in every area "to find the one we overlooked", "develop the great one", and to make sure the rest are doing their job. Our data collection has been for the benefit of finding out more information about our herd. Hiring a third party to collect ultrasound data and evaluate genomics gives us an honest look at our herd and their potential. Our goal is to breed cattle with eye appeal and genetic potential that will improve the U.S. beef herd. Weights were collected on Herefords and continued for the Angus herd at birth, weaning, and yearling ages. Ultrasound started on the Angus herd in the mid 90's. Most of our cow herd has 25 years of recorded performance data. Rarely do we see much variation in preliminary epd's at registration because of all of the data behind our cows. 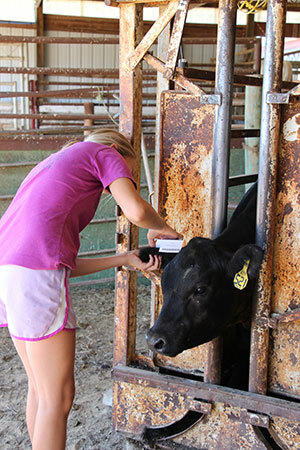 Our first genomics samples were submitted in 2003 shortly after the cattle genome was mapped. Animals earned "stars" to illustrate their genetic potential. We continued to test our donors, potential donors, and now our entire calf crop is genomically typed. Everyday we are reminded of the planning, science, and technology that puts the perfect steak on the plate and burger in the bun! Technology and improvements don't always apply directly to our herd and cattle. In 2012, we made a bold move to run our entire Spring Bull Sale offering through a video sale ring format. This was the first sale of its kind in Wisconsin and first sale our sale crew had ever done. We filmed, edited, and produced, the entire sale offering. The following year we broadcast the sale using "Google" technology. 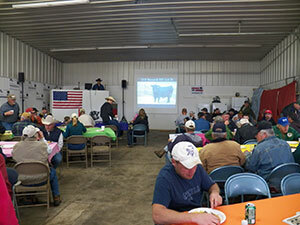 Countless people tuned in with live bidding and cattle going to Nevada and Nebraska. The credit of our success goes to our cow families. Our cow family is the foundation of our exceptional performance numbers from birth to carcass to reproductive traits. The first major cow family investment came with a partnership purchase of GAR Precision 939 (reg # 13397219) in the 2001 Gardiner Sale. This "Rita" had a low birthweight epd, strong growth performance, and generations of proven ultrasound data. Her pedigree was unique to the industry at the time. Her silhouette is the outline used to create our GFC logo. In 2002, we ventured into the Blackcap family with the purchase of GAR New Design 1139, reg# 13397236, from Fairview Angus Ranch, MT. Her full brother, GAR New Design 5050, proved the cow family's potential for long term genetic merit. The discovery of genetic defects challenged us to develop the best "clean" progeny and look for the next great cow. The RB Lady family arrived in Barneveld in 2012 with the purchase of RB Lady Standard 305-890 and RB Lady Party 192-305 in 2013. These two females set records for the entire Lady family. 890 had the ability to give over 25 freezable eggs per conventional flush. Most matings did extremely well producing multiple full siblings for contemporary groups. 192's claim to fame was in the sale ring. At the Riley Brothers 2013 Sale, 192 was the first lot into the sale ring. It was a beautiful 90 degree September day and she was exhausted. She laid down on the entrance ramp and had no desire to move. Sale help haltered her, and she jumped up and got the sale started. All this drama side tracked the audience and Jerry and Scott were the lucky buyers. 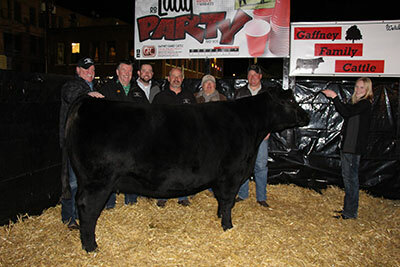 192 joins the elite group of record high selling females sold at the National Western Foundation Female Sale. RB Ladies, Blackcaps, Ritas, Beebe Queens, Forever Ladies, and Primrose Ladies are our featured cow families. Our goal is to raise the best females in the breed. We want to continue to build on the generations of measured and proven performance. 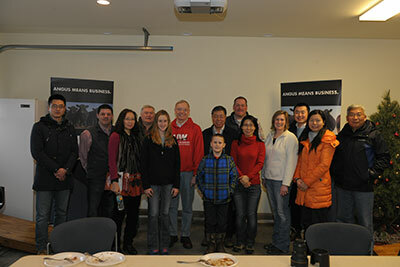 Our success in the Angus business would not be possible without the support of our friends and family. We try to remain active and involved in a variety of industry activities. 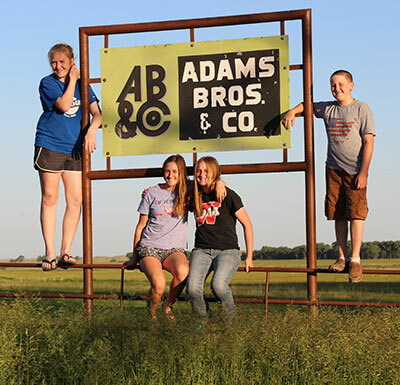 Through organizations such as the American Angus Association, Wisconsin Junior Angus Association, Wisconsin Cattlemen's Association, and the Iowa County Cattlemen's, we try to stay current with the latest industry issues. Beyond being a member in good standing, Scott is serving on the Select Sires National Beef Committee. And Val is President-elect for the Wisconsin Beef Council. We have hosted visitors from every corner of the world except Antarctica! 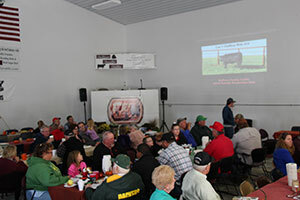 We try to take time to talk about the remarkable things happening in the beef industry to our friends, neighbors, international groups, and local school groups. The U.S. Beef industry has a story to share of sustainable beef with integrity at every stage of production. In the end, we need everyone talking about U.S. beef! It is Our Business. Our Livelihood.